This used to be on YouTube but we can’t find it anymore, alas. We know it’s going to sound a bit banal but we certainly loved it at the time and we know plenty of people have fond memories of it, and it sums up the brilliance of the Broom Cupboard concept, with its incredible spontaneity, perfectly. 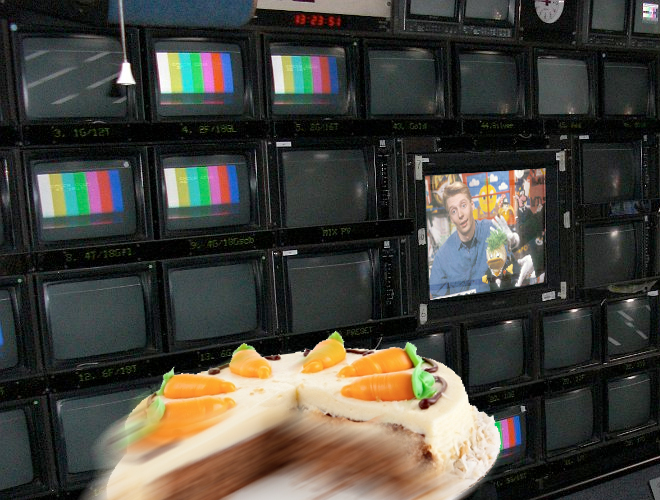 Hence, after an episode of Blue Peter has ended with Yvette Fielding cooking up some carrot cake, we return to the Broom Cupboard where Andy Crane says how nice it looked and how he’d like a piece – only to be told that she was still listening and is on her way to the Broom Cupboard to deliver it. Hence, Crane runs through the next day’s programmes, reads out some letters and says goodbye to viewers in Northern Ireland (who obviously never found out how it ended) before, with exquisite timing, Fielding dashes through the door, cake in hand, about five seconds before they’re faded out. Even if this was planned – which we doubt it was – it’s still a great example of how innovative the Broom Cupboard was, “playing” with TV Centre to great effect. Andy Crane later pointed out one great advantage CBBC had over the ITV opposition was that everything came from the same place, so they felt like a family and could do things like this, and in those days were perfectly happy to let some silly stunt like this go ahead in front of some ten million viewers waiting for one of BBC1′s top-rated shows. Consistently amusing on a budget of about 50p, Yvette’s mad dash around TV Centre emphasises why the Broom Cupboard was far more influential and memorable than anyone could have imagined when they set it up.